Ok, I have always had a passion for art, and I think I'm pretty good for my age. So please don't laugh at me because it is horrible compared to everyone else's. 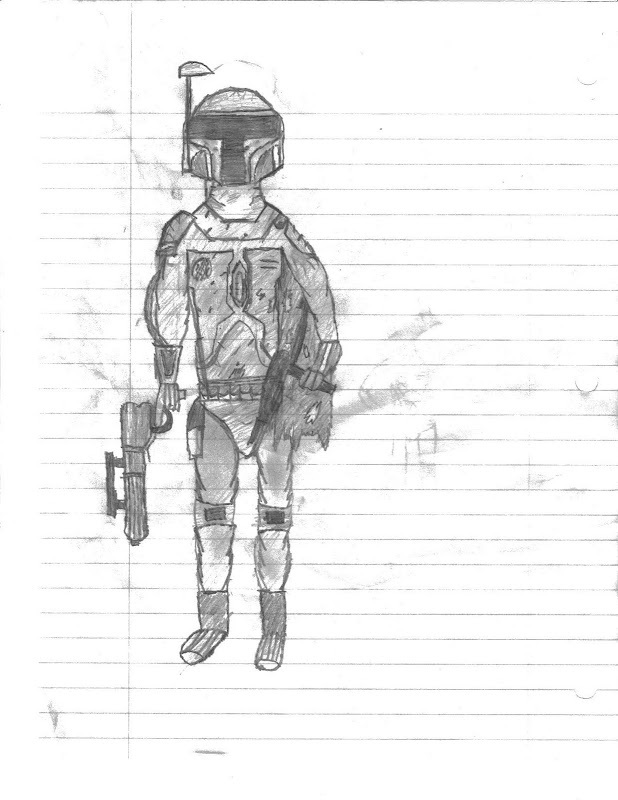 So here is one of my first drawings of Boba Fett. You draw way better then me. Its pretty good. not bad, nice attention to detail. Thats very good for a first try, Kaiza, well done + 1 karma point! Hey Kaiza; just noticed your title. Not sure how your interpreting it. Do you want to join the Clan as an assassin or did you mean it as "Clan Drakus Killer"? If it's the latter, you're goin' down! Well I was using the word Kyramud as in assassin. Sorry if I confused you guys with that. And Drakus, if you want me to change my name, i will. Bounty Hunter Kaiza, Not bad, I like this picture! No need to change it if you want to join. Even if you don't, it's your title; put what you want. But if you or anybody else wants to be part of my Clan I'd appreciate you letting me know and working out something first. I'm hoping to have a working Clan here where we can have fun by working together in RPGs and the like, co-ops in creative ventures, and helping eachother out with Star Wars info and other stuff. Ok!!!! Thank You!!!! And im sorry about the trouble, I shouldve informed you first. Um guyz, I don't mean to be harsh or anything, but if we r gonna talk about this stuff, we might as well talk about it in the original topic Ralin made. This topic is Kaiza's fan art. The other one is about the clan. SO it's better if I told you that than another mod. um I dont now how to do that adress thing but it is under general and it is called "would anybody be intrested in making clans like Mando'a culture?" Not true, Cyar'ika. You're better than you think. Kaiza, you have anymore drawings you'd like to show? I think you really have some potential. I can draw some more drawings if you want me 2!!! Any requests? Was that 2 me or Green? yeah, I'm starting to be a little annoyed. Why Cant I Join?? ?